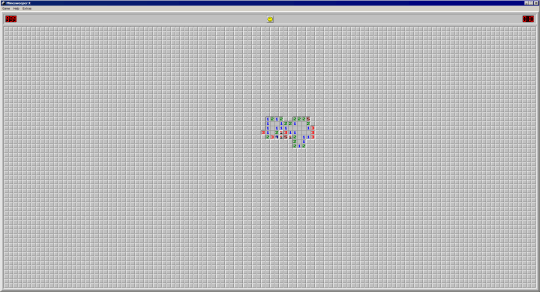 Minesweeper is probably one of the most widespread computer games ever. And people might object to bundling Internet Explorer with Windows, but I don’t think anyone ever objected to bundling Minesweeper. But want if you want bit more complexity or features? I tried some Minesweeper clones over years, but none came as close to enhancing it while preserving original gameplay like Minesweeper X.
Minesweeper X is extremely precise clone of Windows Minesweeper (XP version) with additional features. Main being much much larger custom boards that can give you some serious full screen fields. It also keep precise statistics and can make videos of games. Replicating graphics and gameplay exactly provides usual experience. Most clones annoy me with subtle difference, this one plays completely as original. Large boards are killer feature here, playing on 27” display is seriously intense. App is tiny and works without installation, but seems to write settings in registry. It would really make sense for it to be completely portable.